Notes from the Fickell presser, and other happenings around the world of college football, including updated NCAA investigation information (it’s not just us) and the latest on conference expansion. Injury Update- Nathan Williams is still out, and Adam Homan had surgery this week. Andrew Sweat is banged up, but expected to play, but there’s no official word on Philly Brown at this time. Fickell Speaks- If you’re a fan of discussing time outs and so forth, you’d have loved today’s press conference. The long and short of it- He wished he would have called a time out prior to Miami doing so late in the fourth, but was also thinking that the offense would need at least two if they were going to make a comeback from being down two scores. I know Joe hurts every bit as bad as I do. Just like me up here, I smile and I show that I’m happy and everything’s going great when my stomach down inside is sometimes in a knot. No, that’s not something you want to see. Whether he was disguising or masking how his gut felt, I have confidence that Joe hurts every bit as much as I hurt. We try and tell those guys, nothing goes unnoticed whether it’s on the sidelines of a game, whether it’s in a classroom, wherever you are having something to eat. Just make sure you understand that. As we mentioned earlier, the Ohio State Athletic Department today released their response to the NCAA’s Notice of Allegations, and submitted recommended sanctions for the transgressions. You can find the documents here: OSU Newsroom NCAA Documents, including the initial NOA. One thing to be clear of- These are the University’s response to the NCAA’s Notice of Allegations. While that may be obvious, let me also express the converse- These are NOT the university’s response to any other allegations, founded or dis-proven, that have been raised by Sports Illustrated (to an extent), ESPN, The Dispatch, That one guy on the fan-board you subscribe to, or Something that your mom’s mail carrier’s girlfriend’s podiatrist’s veterinarian told them. Information was reported to the University and the enforcement staff subsequent to the Notice of Allegations that still is being reviewed. This review continues and the University will report any additional violations if necessary in the future. And given the fact that the University has been quick to respond thus far, there’s little reason to doubt this is true. I’d encourage readers to look through the entirety of the documentation- if nothing else, it will help prepare you for future conversations here and with friends regarding this matter. They are incredibly thorough. Again, admits that he should have taken the information to the University officials. It’s a brief document, and I imagine that there will be more questions for Tressel during the meeting in August with the NCAA, which the University has said he will be attending in spite of his “retirement“. Update- All documents in the University’s response to the NCAA are now available online. Update 2- Gene Smith defends the proposed sanctions. 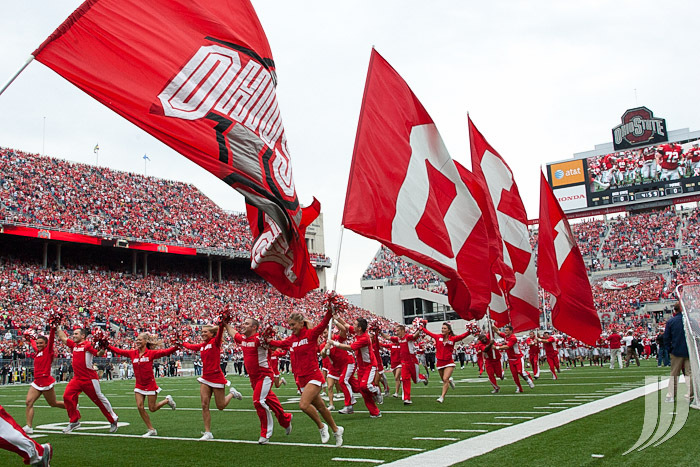 Today, the Ohio State University submitted its response to the NCAA’s Notice of Allegations, including several self-administered penalties, according to the Columbus Dispatch. The Dispatch, is reporting that the University is placing the football program on probation for two years and is vacating all wins (including the Sugar Bowl) from the 2010 season. While admitting that the Athletic Department technically falls under the category of “repeat offender” (stemming from issues with the basketball program in 2004, as well as Troy Smith receiving improper benefits in the form of $500), it holds that the circumstances warrant the recommended response. According to the Dispatch, the University is not recommending or administering stricter punishment (post-season bans, lost scholarships) due to the fact that the violations were contained to former coach Jim Tressel, who the University asked to resign. Interestingly enough, Tressel will be paid for the month of June and will not be asked to pay the $250,000 fine initially levied by the University. He will also appear at the August 12th hearing in Indianapolis. Update- here is the agreement between the University and Coach Tressel. It is after that hearing that the final decision regarding this situation will be made- these are self imposed sanctions, and should be seen as a “baseline” for NCAA response. It is speculated that the final tally will include post-season bans and scholarship losses, as well as significant sanctioning for the former Ohio State coach. One additional finding in the Dispatch’s report- Another student-athlete was found to have received discounted tattoos in exchange for memorabilia, and has been suspended. The University has appealed to the NCAA for his reinstatement- at this time his identity is unknown. Get better documentation of car purchases. To ensure that athletes are not getting inappropriate deals, dealers or players would provide records detailing transactions. Currently, athletes report how they obtained cars, but they don’t provide any supporting documentation. Set a time limit on “loaner cars.” The university would limit how long a student-athlete can borrow a car from a dealer or individual. Currently, Ohio State does not set a limit. Audit vehicles several times a year. Ohio State would check parking lots used by athletes to ensure their cars are registered with the university. Unregistered cars would be ticketed. Check everyone who receives game passes from football or men’s basketball players. At the beginning of the school year, students would be required to provide a list of anyone who might receive passes to games. The compliance department would talk to each person to determine his or her relationship to the student. Currently, Ohio State does random checks. Examine students’ budgets. A new software program will help officials guide students on how to manage their money. Ohio State officials say the main goal is to educate students, some of whom have never had a checking account before college, but the software also could help generate red flags about students who are living beyond their means. Many of these recommendations were already in the works following the earlier audit of the compliance office. Ohio State’s compliance department says much of its focus is on educating students and coaches about NCAA rules to avoid violations. But they say a big focus now is to address the people outside of Ohio State. “The people who are trying to get close to (students) for unscrupulous reasons are pretty talented and skilled at what they do … so their ability to persuade and influence is pretty doggone good. … That to me is one of our biggest weaknesses and where our focus is,” Smith said. To get the outside community involved, for instance, the university plans to work with car dealers who agree to provide records about sales. Athletes interested in buying cars could check the university’s list of participating dealers to simplify the effort to follow NCAA rules. Students who buy elsewhere would be required to provide the records themselves. Given that the compliance office was already working with dealers, which resulted in the “one dealer sold a lot of Buckeyes cars! !1!l1!l” crisis, it will be interesting to see how this plays out. But what I’m most intrigued by is the education of the “people outside of Ohio State”- since I don’t believe that many of them will care. Most of the things being investigated aren’t accidental (Like Nebraska’s “recommended reading” problem), but actual attempts on the part of both parties to disregard NCAA and OSU guidelines. And all the “education” in the world isn’t going to solve that. We’ll continue to bring you coverage of this as it develops, including full coverage and commentary as the official response is made available to the Media. What a better way to put a bow on the big game in the Big Easy than with a couple of visual reminders of the Buckeyes winning their 6th BCS game. First up, this great highlight video from Robby Donoho that highlights the action on the field as the Buckeyes’ were able to end the drought of victories against SEC schools. We’re excited to also let you know that you’ll be seeing more of Robby’s work here at tBBC as he brings his talents to our little corner of the Buckeye web-o-sphere. Foot on the gas pedal - Well, at least for the first half… After that, everyone’s ulcers kicked in. The Buckeye Five to shine – Indeed. From TD catches and runs, to THE play that sealed the game; these guys earned their redemption. No false starts – Failboat, party of one. Tomorrow evening, Ohio State will be playing in their 9th BCS bowl game, the most appearances by any school. If they play well, they have the opportunity to win their sixth BCS bowl, which would tie Southern Cal (even though one win was vacated) for the most BCS victories by any school. Clearly, Ohio State has had its share of BCS success, no matter what the talking heads on TV say. Despite the past success, or more likely because of it, anticipation for the Sugar Bowl is down in Buckeye land. Ohio State’s fan base has been spoiled by unparalleled success the past decade, which leads to disappointment at anything less than a national championship run. Good or bad, that is just the way it is these days. Obviously, the off field shenanigans don’t help. When news of the indiscretions broke, my holiday season (at least the football enjoying part of it) went to hell. On top of that, a Buckeye win will be tainted and a loss will add to Buckeye bowl woes against the SEC. If that weren’t enough, after a truly terrible showing by the Big Ten on New Year’s Day, the reputation of the entire conference rests with the good guys yet again. Clearly, the baggage and the implications of the game are staggering. It is a unique situation to say the least, and a game that is difficult to get excited for due to the circumstances. Arkansas, on the other hand, will be playing in their first BCS bowl game and the differences between the two fan bases are night and day in terms of excitement (even though I am sure the Buckeyes will be well represented in New Orleans, as always). My hope is that once the two teams hit the field, all of the garbage will disappear and we can all enjoy a great game of football. To truly enjoy the game, the television may be going on mute very quickly. A repeat of last year’s Rose Bowl – Shake things up with the playbook, catch them off guard, but above all, be in attack mode from start to finish. Foot on the gas pedal - After Saturday’s embarrassment for the Big Ten, we need to remind the nation that we are not the lousy conference that they think we are. Also, at the same time, we’ll be reminding everybody why we are the 6-time champions. The Buckeye Five to shine – Haters gonna hate no matter what we do, but the fans will rally behind Tressel’s decision if the five suspended players outshine everybody on the field. No false starts – Because if two of us ask for it, maybe it’ll happen.